“Waiting On Wednesday” is a weekly meme hosted by Breaking the Spine. Every Wednesday we get to highlight a book that we’re really looking forward to. I love the Mercy Thompson series – I’ve already seen this around the place,but even so, I really want it!!!!!! Due March 2016. Just finished reading Night Broken, the 8th book in Patricia Brigg’s Mercedes series which I really enjoyed. As with any series like this there can be peaks and troughs. I didn’t particularly enjoy River Marked for example, for me, it felt like it went a little bit off track – or maybe it was simply because the majority of the story was based on Mercedes and Adam. However, the last book Frost Burned turned me around again and this book feels like a really solid edition in the series. In fact, taken as a whole I now like River Marked a lot more than I originally gave it credit for – Briggs is slowly turning this into something else. It’s not just a series of books with a bunch of random adventures each time. Everything is connected and the characters and world are adapted further and grow in intensity, likability and depth with each new edition. At the start of the book life seems to be ticking along relatively smoothly for Mercedes until Adam’s ex wife, Christy, rings. She’s running away from her boyfriend who appears to have become possessive and physically abusive and she’s called on Adam and his pack for protection. Of course Adam can’t really turn her away in her hour of need, apart from the fact that she’s the mother of his child he is, lets face it, a bit of a pushover for a damsel in distress. So Christy moves right back in – literally picking up with the pack and the house as though she’d never been away. I confess I didn’t like Christy very much and struggled in my mind to see what attraction she would ever have had for Adam. Okay, she’s an attractive woman, soft and feminine and quite the opposite of Mercedes in virtually every way but she’s also a scheming and manipulative mare whose only experience of the truth seems to be in finding ways in which to bend it! You could say that she’s very careful with the truth, if you were feeling generous you could say that! If not then you might call her a few expletives which I won’t put here. Unfortunately her lack of forthright honesty is about to put everyone in great danger as the ‘boyfriend’ she is running from is much more than at first suspected. Now, just in case this all sounds very pedestrian and not quite the rough and tumble, anxiety packed fight for life that we’ve almost come to expect from Mercedes, yes, there is a little bit more of a ’slowed down’ feel to this book but in spite of that it’s one of my favourites so far. This book spent more time integrating Mercy into the pack and establishing her relationship with others. I like Mercy, she’s a strong character and through the series she’s definitely changed. She started off as a loner, working hard and having very little time for anything or anyone else. Gradually though she’s adapted. She has Adam now and is part of his pack and family. She can’t always just think about herself but has to stop and consider her actions in terms of the impact they’ll have on others. On top of that she is in no way the toughest of the bunch but that doesn’t make her into a shrinking violet, she stands her ground even when she’s actually shaking inside with fear. I like that Mercy is a flawed character, she’s not perfect and like the rest of us she has her own insecurities and petty jealousies to deal with. Alongside the domestics, never fear, Briggs has spiced up the story. This isn’t all about who has the longest eyelashes and can bat them the most effectively whilst baking the perfect batch of cookies – Briggs has injected her usual helping of ‘nasty’ and also come up with a whole new deity! Well, probably not new exactly but certainly one that I haven’t read about before. He may be wrapped up in a human package but he’s the furthest thing from human and very difficult to eliminate – particularly as he seems to be accompanied by two fearsome, huge black canines who seem to have stepped straight out of hell. We also have the appearance of the fey as one of the Grey Lords makes himself known to Mercy – with a none too subtle request for her to return to him one of the fey artefacts that came in useful in a number of previous stories – and you don’t want to disappoint this particular Grey Lord – his idea of anger can lead to tsunamis and mass destruction on an apocalyptic level! Of course retrieving this is going to be far from easy, particularly as it’s now in the hands of Coyote and we all know how tricksy he can be. There’s appearances from a few other favourites. Stefan briefly makes a show and we learn more of the bond (and the feelings) he has for Mercy. Tad shows up at a very opportune moment and we make the acquaintance of one of Coyote’s other children, appropriately named Gary Laughingdog. Half brother to Mercy who was quite useful to have around in a fix with his prophetic visions of the future. I think he will probably make return appearances in future stories and I quite look forward to that. In terms of criticisms, yes, I had a few, but they were really minor. Just niggles really – like, other than a strange plot device to provoke jealousy, how come Adam never answered his own phone! It’s a mobile phone – which means it goes with you – and who the hell answered his phone before Christy returned to the marital home?? See, small time niggles, nothing to get excited about. I really enjoyed this and probably the biggest problem was it came to an end all too suddenly, I wanted more and it’s going to feel like a long wait now. This is without doubt a strong contender to be one of my favourite urban fantasies, Briggs has managed to come up with not just a main protagonist who you can’t help liking, but a whole cast of characters that you will become equally attached to. She’s also a bit tricksy herself, there are a few twists and turns along the way, plotlines that you just have to run with because they will ultimately twist together into a unified thread not to mention a complete curveball towards the end which for a few moments made me sit bolt upright with my mouth gaping open very attractively! 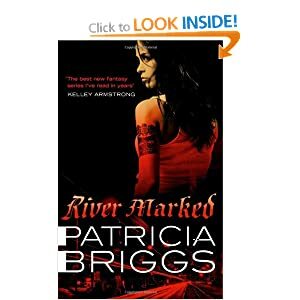 Just finished reading River Marked by Patricia Briggs which brings to us the sixth in the Mercy Thompson series of books. Before I start with this review it is possible that there will be spoilers. River Marked has a different feel from the other books in the series, it’s not as fast paced, gritty or, frankly, urban. I guess this isn’t too much of a surprise as we virtually start the story with Mercy and Adam finally getting married and going off on their honeymoon. Of course, we know that everything isn’t going to be as rosy as that, this is Mercy after all, and sure enough a new and frankly rather horrible monster is lurking in the Columbia River, eating happy campers and attracting the attention of the FBI who believe a serial killer may be on the loose. This is a strange book to review. It was a quick read and, to be honest, I didn’t dislike it. The pages turned swiftly and before I realised I’d read about two thirds – but, there wasn’t to be honest a great deal of plot to this story. We were introduced to a new cast of characters as the old familiars took a back seat and we found out a little more about Mercy’s heritage. But, this particular installment didn’t have the tension of past books. I think we seriously miss the other characters who form such a big part of Mercy’s world. I mean, I know they were on their honeymoon but it just felt too isolated. The whole honeymoon in a trailer on a totally deserted campsite was also a bit of a stretch for the imagination. So, I did like this book, it was interesting, but, it wasn’t what I was expecting and it made me think at times that Mercy has changed. There’s still a lot of talk about things will never be dull with Mercy around, etc, etc, but she definitely feels as though she’s been tamed. She’s never been unrealistic about her own capabilities but she seemed to spend a lot of time in this book stroking Adam’s ego or working out how to not rile his inner wolf or mediating for his daughter or worrying about somebody or other. The thing is, there’s nothing wrong with this style of Mercy in itself or even this style of story it’s just that it wasn’t consistent with previous books and not what I’ve come to expect of Mercy. Now, all that being said, and it does sound more criticial than I intended, this is still a good read and I will certainly have no hesitation in picking up the next – I just hope that in the next novel we don’t find Mercy wearing an apron and in search of the perfect meatloaf recipe to satisfy her man! But the fact is, I’m invested in these characters now, I can take a bit of a break – almost a bit of an in-between, filler, book, because I do want to read more. So, whilst this might not be my favourite of the series I’m still a big fan of Patricia Briggs and I love this world she has created. I think Mercy is an amazingly strong character with a really well written supporting cast. I would definitely recommend reading this series as they have just been so good to read. Anyway, this book I felt took a change in direction, it was more pedestrian, if you want to put it that way or maybe, not quite as fast paced. But, in a good way. This series is really coming into it’s own. In every book you learn a little more and this book was brilliant for that. 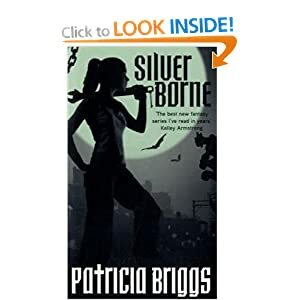 With Silver Borne we get a bit more insight into the whys and wherefores. Now, don’t be thinking that means this was a boring ride. None of this series could ever be accused of being boring and this installment is no different – it just didn’t feel quite as ‘life or death’ as some of the others which I think is a good thing – I needed to regroup. Basically, with Silver Borne we get a little more insight into Mercy’s relationship with Adam and actually witness some of the vulnerability that both of them suffer. We still have Mercy dealing with the trauma of previous events and we get to see Sam finally be overtaken by his inner wolf -now this isn’t a surprise because it’s been building in previous books but it’s like we finally see a bit more into what really goes on – like two personalities sharing the same body! Plus, Mercy has to try and buy some time for him because if the rest of the weres find out, he’s toast! On top of all this, back on to the scene, are the fey, in this installment looking for a precious object and wanting a bit of a chat with Mercy to try and locate it. We are talking about a fairly high ranking fey here, not to be scoffed at (but I’m not going to give it away totally). Long story short, there is werewolf drama provided by Sam and his recent turn of events and Mercy drama with people being kidnapped and in need of rescuing. We get to see Zee in person – and he’s pretty cool if I do say so myself! And, we find something of interest for Sam (which he totally deserves). So, this series is so good and so well planned. 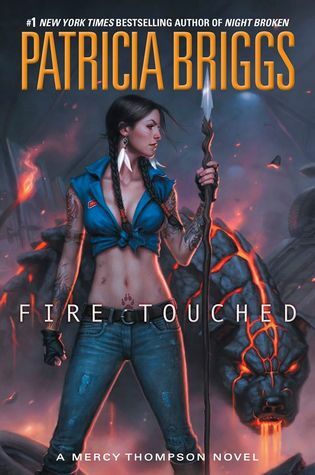 I’m totally invested in the characters by now and lets face it – Mercedes is just brilliant (awesome if you will) and Patricia Briggs has built such a brilliant urban fantasy world. It’s dark and gritty, fast paced, full of characters (no Stefan in this addition – boo), got an amazing lead character, bit of romance, danger, etc, etc, need I go on? Anyway, give it a try, for me the first one is not my favourite so I think you have to bear with it but from there onwards it just goes from strength to strength.